SiteGround has begun their journey in Sofia, Bulgaria. It was 2004. But now they have become one of the most used web hosting companies in the world. They are serving about 250,000 customers all around the world. And, they are doing it pretty successfully. On the other side, HostGator is a bit older than SiteGround. They have started in 2002. And, they have acquired about 400,000 customers in the meantime. Day by day, both of these hosting companies are improving their service and gaining more and more new customers. If you are trying to get a new web hosting account, you might be wavering between these two options. Fear not. We are here to help you diminish your confusion. Today, we are going to compare both of these popular web hosting companies. After that, you will be able to know which one is the best option for you. Both of these hosting providers offer a wide variety of hosting services. In this post, we will be talking (and comparing) about 4 of the most popular hosting services provided by them. They are Shared, Cloud, Dedicated, and WordPress hosting service. So, let’s begin with the shared hosting service. SiteGround comes with 3 shared hosting plans named as StartUp, GrowBig, and GoGeek. Let’s go into more detail about this plans. This plan is priced at 3.95$ per month. And, it is possible to host only one website with this package. You will be provided with 10 GB web space and all the essential features that come with SiteGround’s hosting plans. We have covered all the features on the shared hosting review of SiteGround post. So, we will not go into greater detail here. This package starts at 5.95$/monthly. And, you can host unlimited websites with this plans. Yet, you will be given only 20GB web space. Also, you will get all the essential and premium features with this package. You have to pay the highest price for this shared hosting plan form SiteGround. Because it is the best plan among all the plans here. It comes with all the essential and premium features. However, that’s not all. SiteGround also offers some advanced features named as ‘Geeky Features’. And, this price of this package starts from 11.95$ per month. In return, you are getting 30 GB web space and allowed to host multiple websites. Now, that you know about the price range of the shared hosting plans of SiteGround, we can proceed to the HostGator’s shared hosting plans. HostGator also has 3 shared hosting plans which are similar to SiteGround. The names of those are Hatchling, Baby, and Business respectively. 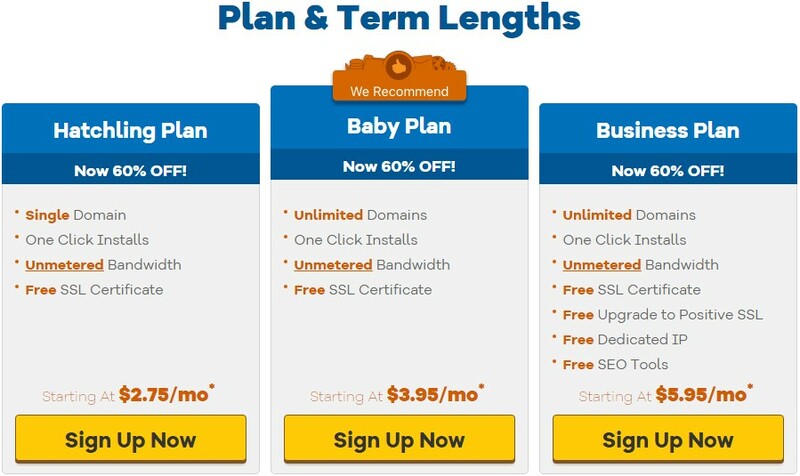 This is the lowest priced plan from HostGator. The price starts at just 2.75$ per month. And, the limitation of this plan is that you can only host one website at a time. Other than that, everything is great. You will get unlimited web space and Unmetered Bandwidth. This is the most popular shared hosting plan of HostGator. The price starts at 3.95$ per month. And, you can host unlimited websites. Also will get unmetered Bandwidth and web space. If you have some bigger websites then you can get this plan. It comes with some additional features which are not available with the other two shared hosting plans of HostGator. It will cost you at least 5.95$ per month. And, you can host unlimited websites with unmetered Bandwidth/web space. Along with all these, you will get free dedicated IP address and free SEO tools from HostGator. These will come in handy for your business websites. In general, you can see that the price of the shared hosting plans of HostGator are less than the SiteGround’s plans. We can’t deny that. Next, when it comes to specifications then we see that SiteGround is providing a fixed amount of web spaces whereas HostGator is giving unlimited web spaces. But, there’s a catch here. When you are getting unlimited space on a shared hosting plan that is actually not unlimited. In case your websites start to get an enormous amount of visitors, then HostGator will send you a notice about it. And, eventually, you will have to upgrade your plan. On the other hand, you exactly know what you are getting from SiteGround upfront. So, it will be better to manage your websites according to the limitations as you already know them. Now, if you talk about the features it is clear as daylight that SiteGround has the upper hand here. For instance, SiteGround offers some unique features like free Cloudflare CDN, free Daily Backups, and free CMS specific plugins etc. And, if you get the GoGeek plan you will be getting some advanced features which are ‘Staging’, ‘Git Repo’ creation, and free backup and restore on demand etc. But unfortunately, none of these features are available with any one of the HostGator Shared hosting plans. So, even though the SiteGround has pricier plans, we believe you will have more flexibility and features with SiteGround. Thus, Siteground is the winner here. All of the SiteGround’s Cloud Plans are high-end. So, they are expensive as well. You can choose from 4 cloud hosting plans of SiteGround which are Entry, Business, Business Plus, and Super Power. The price of this plan starts at 80$/monthly. And it comes with 4 GB RAM, 40 GB SSD, 2 CPU Cores, and 5 TB Data Transfer per month etc. For a price of 120$/month, you can get this plan. You will get 60 GB SSD, 6 GB Memory, 3 CPU Cores, and 5 TB Data Transfer per month etc. You will be getting 8 GB RAM, 4 CPU Cores, 80 GB SSD Space, 5 TB Data Transfer with this package. You have to pay at least 160$ per month to get this plan. The most expensive cloud hosting plan of SiteGround is the ‘Super Power’ Plan. By paying at least 240$ per month you will get 120 GB SSD Space, 10 GB RAM, 8 CPU Cores, and 5 TB Data transfer per month etc. Now, here’s the thing. 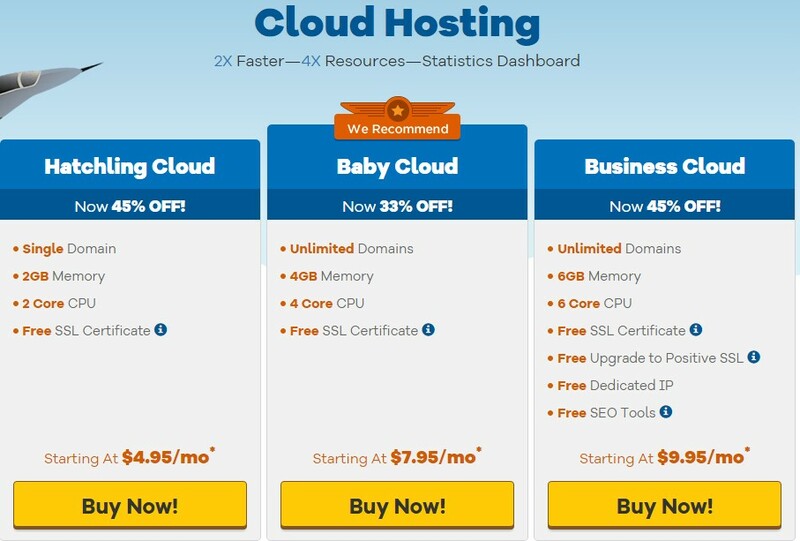 HostGator also offers cloud hosting but they don’t come with high-end specifications like the SiteGround’s. On the contrary, HostGator has VPS hosting which is another similar hosting service to the cloud hosting service of SiteGround. So, we will discuss the plans of both of the VPS and Cloud hosting of HostGator here. There are 3 cloud hosting packages of HostGator. You can host only one website with this package. Also, you will get 2 GB RAM, 2 Core CPU, and other basic features with it. The cost of this plan is 4.95$ per month. This is the plan which is officially recommended by HostGator themselves. You can get this by paying only 7.95$/month. And, you will receive 4 GB RAM, 4 Core CPU etc. You can host multiple websites with this package. The price of this plan starts at only 9.95$ per month. It will come with 6 Core CPU, 6 GB RAM, free SSL certificate, free Dedicated IP and free SEO tools. It is clear that these cloud hosting plans are nowhere near the plans of SiteGround. So, we will now tell you about the VPS hosting plans of HostGator. 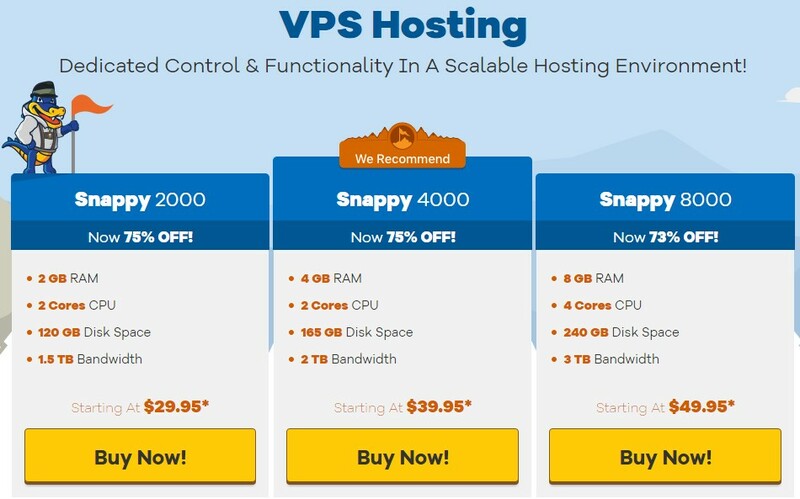 They have 3 VPS plans which are labeled as Snappy 2000, Snappy 4000, and Snappy 8000 respectively. The price of this plan starts at 29.95$ per month. And the specifications it comes with are 2GB RAM, 2 Cores CPU, 120 GB Disk Space, 1.5 TB Bandwidth etc. The second plan is priced at 39.95$ per month. And, the specifications are 2 Core CPU, 4 GB RAM, 165 GB Storage Space, 2 TB Bandwidth etc. The last plan will cost you at least 49.95$ per month. In return, you will receive 3 TB Bandwidth, 4 Core CPU, 240 GB Disk Space, and 8 GB RAM etc. Now, it is a tricky situation to compare all these different hosting plans. But, one thing is clear that HostGator again is offering low priced packages. On the flip side, SiteGround is offering very high priced packages compared to the HostGator plans but with high-end specifications. So, if you want the best performance from your website then our bet is on SiteGround. But, if you want affordable plans by sacrificing performance then you can go with HostGator. SiteGround also offers very high-end specifications with their dedicated hosting plan. Thus, the prices of these plans are high too. Also, they offer location-based dedicated hosting (USA, Europe, and Asia-Pacific). So, the price also varies depending on the location. There are 3 dedicated plans named as Entry, Power and Super Power. We will give you a quick summary of all of these plans. You have to pay at least 269.00$ per month to get this plan (USA, Europe). Sadly, the ‘Entry’ dedicated server from the Asia-Pacific location is sold-out at this moment. The ‘Entry’ server comes with 16 GB DDR3 RAM, 480 GB SSD Space, 10 TB Bandwidth, and an Intel Xeon E3-1230 CPU (3.20 GHz, 4 Core, 8 threads). 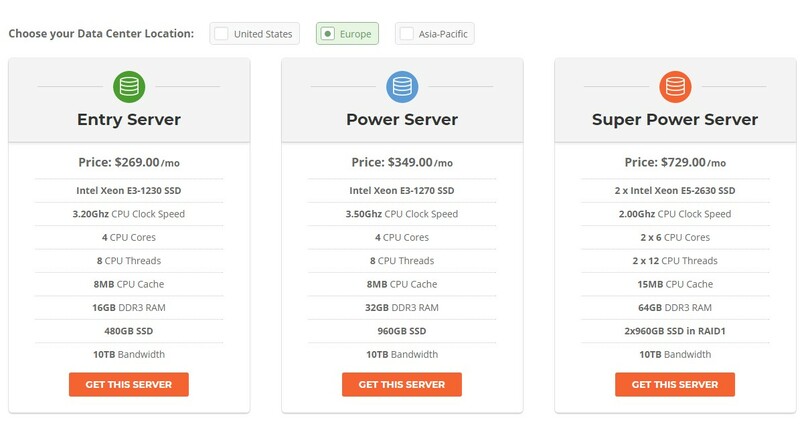 The price of this server is 349.00$/monthly (USA, Europe) and 609.00$/monthly (Asia-Pacific). Although the prices are different based on the location, the specifications are similar. So, this package includes 32 GB DDR3 RAM, 960 GB SSD Space, 10 TB Bandwidth, and an Intel Xeon E3-1270 CPU (3.50 GHz, 4 Core, 8 threads). This is the most powerful dedicated server you can get from SiteGround. It will cost you 729.00$/monthly (USA, Europe) and 929.00$/monthly (Asia-pacific). With this package, you will get two 960 GB SSD in RAID 1. The RAID 1 technology is used for data mirroring. Your data will be stored on both of these SSDs. So, your website will run even one of the SSDs fail. You will also get 2 x Intel Xeon E5-2630 CPU (2.00 Hz, 2 x 6 Core, 2 x 12 threads), 64 GB RAM, 15 MB CPU Cache, and 10 TB Bandwidth. You can see for yourself that it will be a very powerful server. 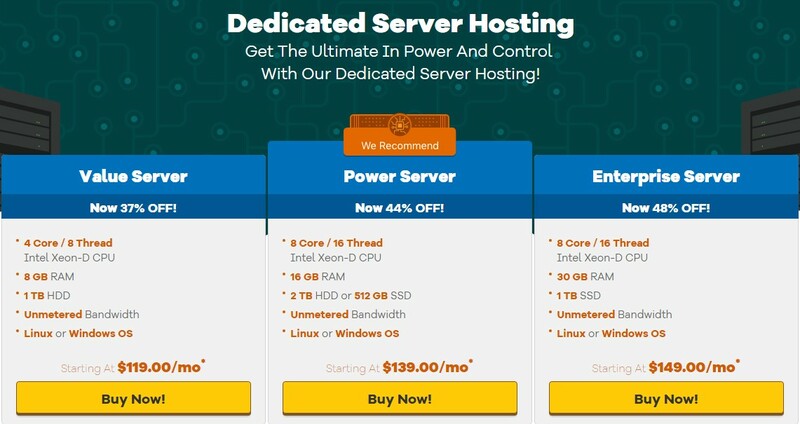 HostGator also offers 3 dedicated hosting plan. Let’s learn more about them. This budget-friendly plan is priced at 119.00$/monthly. And, in return, you are getting 1 TB HDD, 8 GB RAM, Intel Xeon-D CPU (4 Core / 8 Thread), unmetered Bandwidth and option to choose your OS between Linux and Windows. This popular dedicated hosting plan is priced at 139.00$ per month. And, you will get 16 GB RAM, Intel Xeon-D CPU (8 Core / 16 Thread), 2 TB HDD or 512 GB SSD, and also the option to choose your desired OS. The Enterprise Plan will cost you the most. 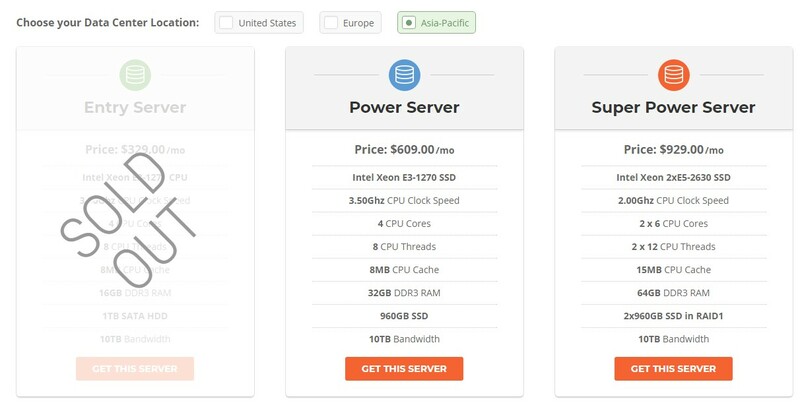 In exchange of paying 149.00$ per month, you will get 1 TB SSD, Intel Xeon-D CPU (8 Core / 16 Thread), 30 GB RAM etc. As always, you can choose your preferred operating system. In this case, it is plain to see that if you are in a tight budget then you can try the HostGator plans. Because those are more affordable. However, if you have power intensive websites then you should choose the SiteGround plans as they come with more resources. 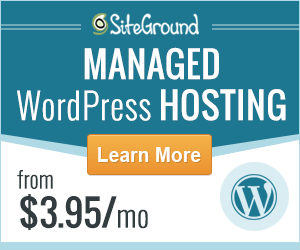 Here’s one thing you should know about SiteGround, they actually don’t have special WordPress hosting plans. Rather, they are offering their normal shared hosting plans as WordPress hosting service with some extra features which are intended for only WordPress users. For instance, the WordPress CMS will be automatically installed on your website from the very first moment. They will also provide some special plugins which were developed by SiteGround only for WordPress websites. So, we will not talk about the plans anymore as we have already covered that on the ‘Shared Hosting’ section earlier. Similar to SiteGround, HostGator also doesn’t have special WordPress packages. On the contrary, they modified their Cloud hosting plans and they are offering those plans as WordPress hosting plans. Of course, they offer all the necessary software and optimizations which are must have for WordPress. The prices of the plans are similar to the cloud hosting plans of HostGator. But they have different features. Another thing is that they don’t share the specifications of those plans and they come with some limitations. You can only host one website using this plan. And, HostGator tells that this plan is enough for 100k visits per month. This plan is good for sites which get up to 200k visits per month. And, you can host 2 sites at once on your hosting account. With this plan, you can host 3 sites at once. And, it is enough for 500k visits per month. From the above discussion, you can see that both of these hosting providers don’t actually have special WordPress hosting plans. However, SiteGround is more transparent than HostGator on disclosing the specifications of their plans in this instance. Also, HostGator limits the number of websites you can host on your WordPress hosting account. Conversely, SiteGround allows you to host unlimited websites on their GrowBig and GoGeek hosting plans. So, our final verdict about the WordPress hosting is that SiteGround is well ahead of HostGator even in this case too. So far we have compared the prices of all the plans of both hosting services. Now, we will take it up a notch. We will compare their performance this time. As we believe it is one of the most important aspects of a web hosting company. To make sure that we find the real winner, we will be running two different tests. 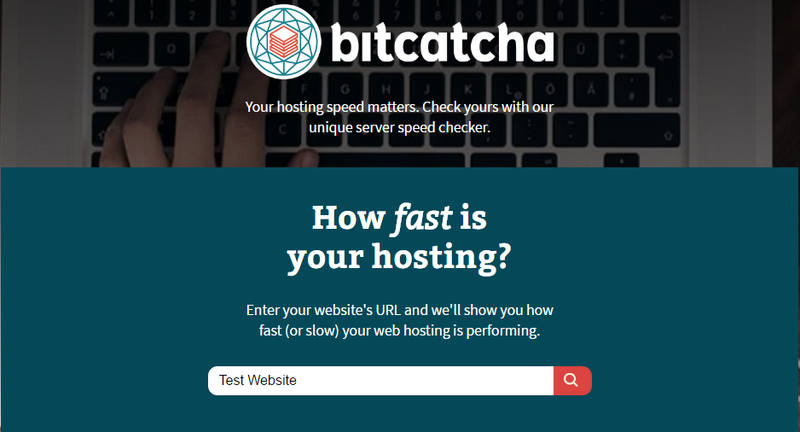 The first test will be a Pingdom ‘Speed Test.’ And, next we will be testing the server ‘Response Time’ of those hosting companies with the help of ‘Bitcatcha’ website. The tests will be done on two specific websites which are hosted on SiteGround and HostGator respectively. That way, we will find an accurate measure of their performance. So, let’s start. Pingdom has multiple test servers all around the world. Here the test is conducting from the Stockholm server. The most important stat form the result for us is the ‘Load Time’. It is better if it is lower. From the above image, we can see that the ‘Load Time’ of our test website was only 685 ms. This is actually pretty fast. Now, let’s see how HostGator performs. In this test, we are using the test server of San Francisco. Here, we can see the ‘Load Time’ of this website was 887 ms. Frankly, it is not very bad at all. However, it is better if it’s lower. First of all, the load time of a webpage depends on a lot of factors. For example, it can change depending on the page size, number of requests, location of the server, the distance between the visitor and the server, and optimization of the website etc. So, it is hard to judge and compare the load time of two different websites. However, in this instance, we can see that the website which is hosted on SiteGround has a page size of 1 MB, and 74 requests. On the other hand, the site hosted on HostGator has a page size of 693.5 KB and only 33 requests. As a result of that, the usual scenario should be that the site hosted on HostGator should load faster than the site hosted on SiteGround. But on the test result, we see that even though the SiteGround hosted site has the higher number of requests and a high page size, it was loaded faster than the HostGator website. So, we have to conclude by saying that SiteGround is the victor here. Now, we will conduct the server response test on both of those websites. 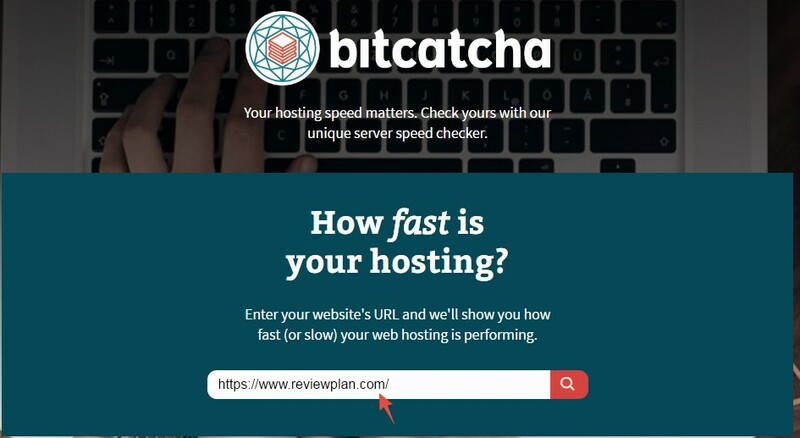 This test will be done with the help of a website called Bitcatcha. They have 8 test servers all around the world to run the test. After running the test, we will get to know 8 different ‘Response Times’ from those 8 servers. And, they will also give the test website a ‘Performance Grade’ based on the ‘Response Times’. Again, it is better if the ‘Response Times’ is lower. So, here we go. From the above image, we can see that our websites hosted on SiteGround has done a great job. We got an ‘A+’ i.e. the highest grade possible. And, all the response times are also great. Now, we will be running the same test on a website which is hosted on HostGator. In this occasion, we see that our test website got an ‘A’. This is also a very good result. However, it is not the highest as you can already guess. The ‘Response Times’ is also low which is good. If we have to choose a winner here, then again we have to go with SiteGround. It is prevalent that SiteGround got the highest ‘Performance Grade’ and the ‘Response Times’ were very low compared to the HostGator’s. So, SiteGround has got our vote. Now, let’s compare the Uptime record of both of these hosting providers. Before we close the curtains, we should compare the uptime record of these two hosting providers. So, it’s time to reveal a secret. Matter of fact, this website (ReviewPlan.com) is hosted on SiteGround. And we monitor the uptime status of our website on a regular basis. Additionally, we have a test website hosted on HostGator and we also monitor the uptime stats of that website. So, we will disclose the uptime record of both of these web hosting companies below. And, you can find out the winner by yourself. To be honest, it’s a shoulder to shoulder competition there. 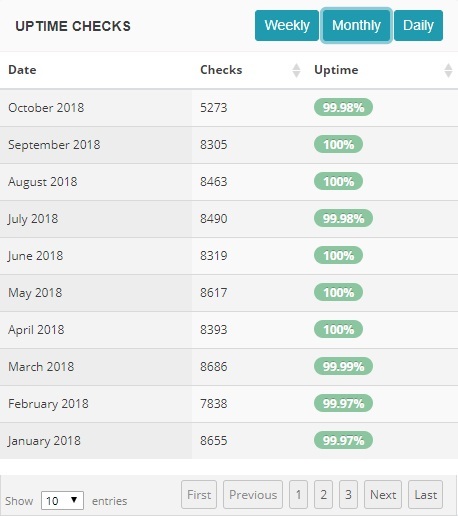 We can see that both of these hosting services are maintaining above 99% uptime constantly. And, most of the months they were able to maintain 100% uptime. That is unquestionably incredible. We keep the information updated. So, if you need to know about the latest situation of their uptime, then you can come back here anytime. Now, we have to say that both of the parties are good. But, SiteGround has a slight edge here. Last but not least, we will give a quick comparison of the customer support system of these two hosting companies. As you know that we are hosting our site on SiteGround, that’s why we need to contact them from time to time. They offer a lot of ways to contact them. For example, Live Chat, Email, Submit a Ticket, and Direct Call. They are available 24/7. And, our experience with them is beyond our expectation. Every time we contact them, they respond to our queries so fast. Sometimes, you don’t even have to wait for more than 10 seconds. Yes, it’s true. You can get a response from them within a minute unlike other online customer services out there. Added to that, they have also a bunch of knowledge base articles and videos on their website which can be so helpful for any website owners. You can solve a lot of problems yourself by following those articles/videos. And, they also offer VIP customer service with some of their advanced hosting service like the Enterprise hosting, Dedicated Hosting etc. That means you will be given the highest priority when you get in touch with them. Above all, we have to say that we are satisfied with their customer support. HostGator Customer support system is also somewhat similar to SiteGround’s. They also offer 24/7 customer support. You can also get in touch with them via Live Chat, Email, Submit a Ticket, and Direct Call etc. However, we have seen that sometimes we had to wait for a couple of minutes to get a response from them. It is normal if you consider their low priced plans. Yes, we have loved their service as well. There wasn’t anything negative about them except that they are a little bit slower compared to SiteGround. You will also get knowledge-based articles and videos on their support page as well. They have about 500+ videos and 700+ articles. And, all of them are free to access for anyone. So, you can take advantage of those. Conclusion: So which is better? To be frank, there’s nothing wrong with going either of these two services. As you know both of these companies have a huge number customers all over the world. If they were bad, then they would have to pack their bags and leave the game a long time ago. Instead, they are dominating the web hosting industry. 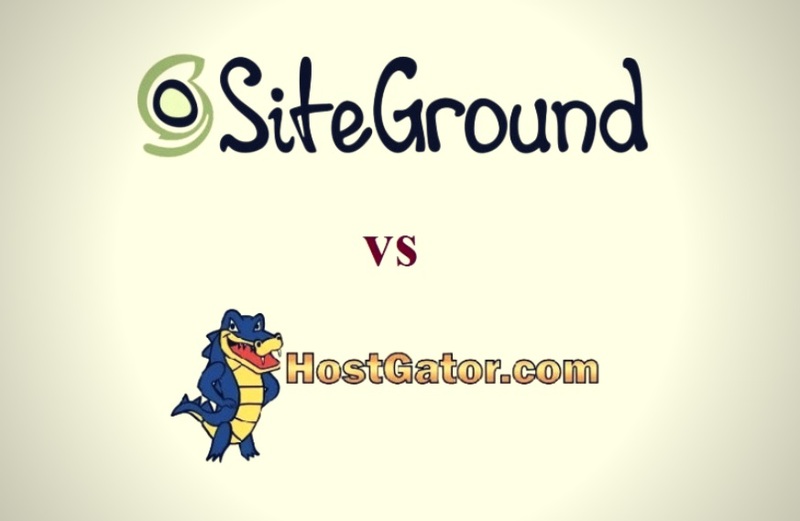 However, if you have followed all of our discussion above it is evident that SiteGround easily came out on top of HostGator. 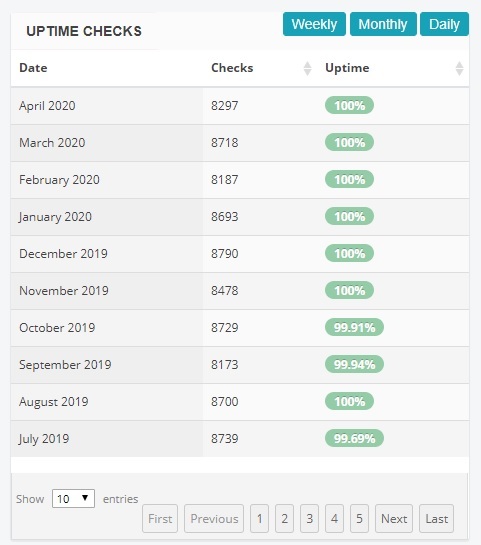 Although both of these have impressive customer support, high uptime, competitive pricing, and a strong commitment to their customers, we have to go with SiteGround this time. Yes, we know the prices of the SiteGround’s plans are higher but we can guarantee you that it will be worth it. Even we are currently using SiteGround on our site. And, we are more than happy. So, the crown goes to SiteGround.